Olivier Giroud and Nabil Fekir were on target as France stepped up their World Cup preparations by beating the Republic of Ireland 2-0 in Paris on Monday evening. Olivier Giroud and Nabil Fekir were on target as France stepped up their World Cup preparations by beating the Republic of Ireland 2-0 in Paris on Monday evening. Chelsea striker Giroud bundled in the opener at the Stade de France, and Lyon captain Fekir — who has been linked with a move to Liverpool — got the second just before the break, with a helping hand from Ireland goalkeeper Colin Doyle. It was a very comfortable victory for Didier Deschamps’ side in the first of three friendly matches before they head to Russia. Les Bleus will also host Italy in Nice on Friday and the United States in Lyon on June 9, with their opening World Cup fixture against Australia in Kazan on June 16. “The game maybe didn’t meet all my expectations, but we controlled it well, got the breakthrough before half-time and our movement was good, so there were plenty of good things to take from it,” said Deschamps. France’s strength in depth, showcased here on a night of torrential rain, thunder and lightning, means they are among the contenders to win the World Cup, 20 years after becoming world champions on home soil. However, bigger tests lie in wait than that provided by Martin O’Neill’s Ireland side. The visitors started with seven players who turned out in the English Premier League this season, but they hardly got near the ball all evening. France were not at full strength, with goalkeeper Hugo Lloris, Paul Pogba, N’Golo Kante and Antoine Griezmann starting on the bench. Raphael Varane has not yet joined up with the squad after winning the Champions League with Real Madrid at the weekend. However, Deschamps handed a fifth cap to Benjamin Mendy, the Manchester City left-back who has hardly played since suffering a serious knee injury at the beginning of the campaign. Fekir won his 11th cap, starting for his country for the first time since he also suffered a bad knee injury in a friendly in Portugal in September 2015. The 24-year-old is coming off a fantastic season at Lyon and was given his chance by Deschamps in a role supporting Giroud. Fekir curled an early free-kick just wide and Corentin Tolisso struck the post for the French in a first half held up at one point by a pitch invader who gave chasing security staff the runaround on the sodden surface. The opening goal came in the 40th minute, Giroud bundling the ball in at the third attempt following a Fekir corner. Fekir made it two a minute from the break, collecting a pass from the ever-dangerous Kylian Mbappe just inside the area, turning and hitting a shot on his weaker right foot that was parried by Doyle. However, the unfortunate goalkeeper could only send the ball up into the air before it spun over the line. 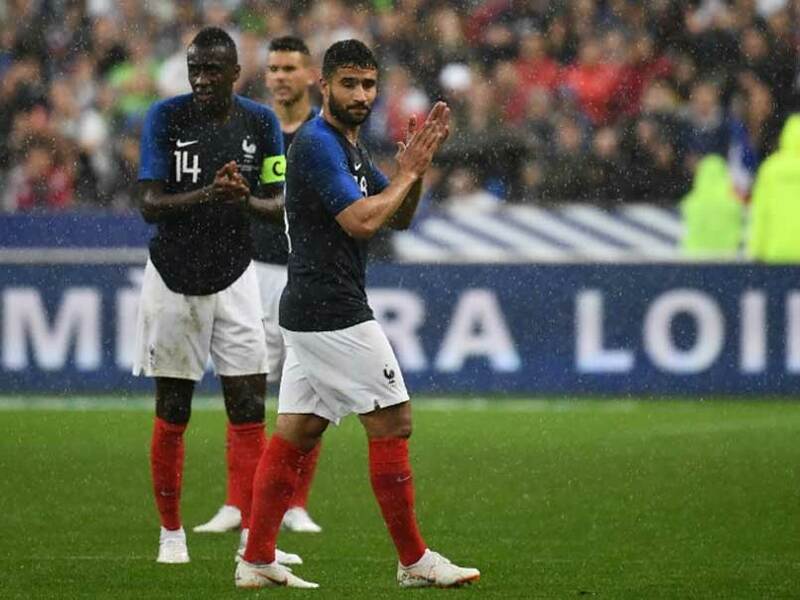 Despite the best efforts of Mbappe — who had a goal disallowed for offside — France failed to add to their lead in a second half regularly interrupted by substitutions before the rain made conditions increasingly farcical towards the end.